I'm back in Cincinnati for a short trip. I'm also half asleep from not sleeping well last night and from driving for the majority of the day. Plus, eastern time is a real booger. I am not staying up for "Big Bang Theory" since that would require being up late since it finishes at 10PM here! Nope - not doing that. 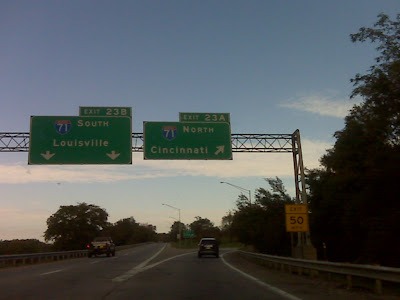 Cincinnati is a great place but I am always reminded of what a dumb move it was to move here in '96 - newly married - taking a job that had nothing to do with my degree just because of the $$. Such a dumb move. It's odd to think about how one decision can completely alter your life. Back in present time, things are holding together. I have a full day of work tomorrow but I'm already a tad ahead. Looks like I will have a rainy drive home Wednesday but I am getting out of here before the first really cool weather of the season drops in. It's only Monday but I am already looking forward to the weekend. My week is booked solid. That's all for this Columbus Day / Thanksgiving Day. I hope you and yours had a good one.